Most antipasti dishes are pretty low fat, but try and choose the best of the bunch. Avoid meats, cheeses and fried foods, and instead pick the grilled vegetables, vegetable based soups or seafood options. 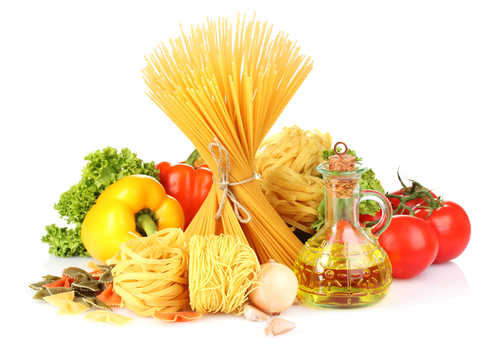 If you are concerned about pasta choices, pick a sauce where vegetables or seafood are the main ingredients. At home if you want to make your favorite pasta dish a little healthier, substitute the new whole-wheat pastas for the traditional refined flours. Try low fat or fat free ricotta and other low fat cheeses. They may take a little getting used to, so start with the reduced fat choices, and then switch to fat free after a few weeks. Soups are always a great healthy, hearty way to fill you up, and if you choose correctly by selecting soups full of vegetables, beans, and grains, you will be getting your daily fill of fiber, protein, and vitamins. Always try to avoid any recipe or menu item that has the word creamy in its description. This will often mean it has either cream added to it, or was developed from a béchamel sauce which has butter as it’s base. That goes the same for the word fried describing any menu item. You know these dishes are going to be ones heavy in both fat and calories, and if you are hoping to lose weight, or even if you just want to make healthier choices this new year, it is best to stay away from these dishes. When preparing vegetables, avoid frying, and instead try grilling or roasting. Both of these alternative methods caramelize the vegetables, bringing out the natural flavors. If you choose a very good extra virgin olive oil, you will only need a very little amount when cooking to add flavor. Add a little additional chicken or vegetable broth when sautéing vegetables, and you won’t even notice the loss of the oil. I make great a great Eggplant Parmesan dish that is low in fat by grilling the eggplant slices instead of frying them, and substituting low fat cheeses. Making correct entrée choices can cut considerable calories from your meals. Try choosing grilled or roasted fish and poultry over beef. Keep your portions small, and add whole grains and vegetables to round out the meal. If you have to have dessert, pick a fruit based one without heavy sauces. A couple of low fat favorites of mine are ripe peaches soaked in red wine, or grilled pineapple slices served with a scoop of frozen yogurt. You can see that although Italian foods are in essence good for you, with a little thought, you can pick the very best choices. Remember, they even say that a glass of red wine a day can be beneficial to your health!